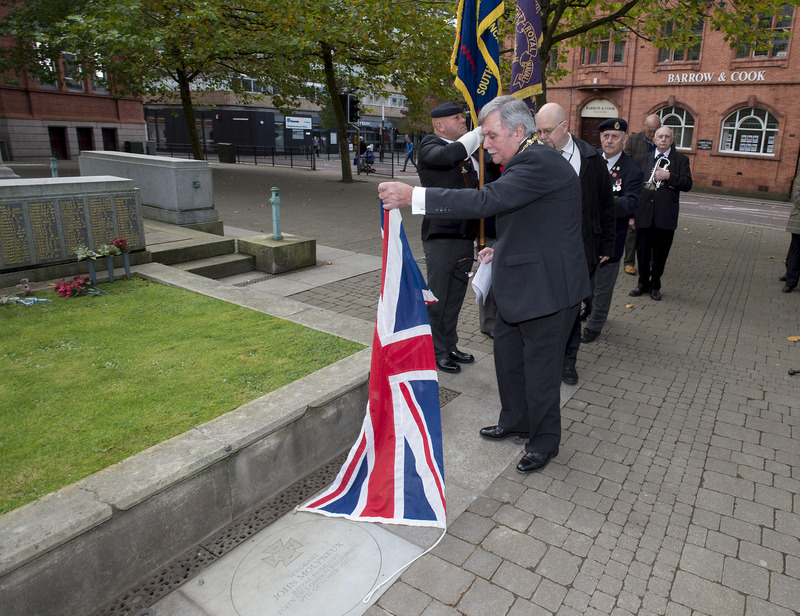 A commemorative paving stone was officially unveiled outside St Helens Cenotaph today (Monday 9 October) in honour of a local serviceman 100 years to the day since he earned the Victoria Cross medal. Sutton-born soldier, Sergeant John ‘Jack’ Molyneux was awarded the highest military award available for his brave actions on the front near Langemarck, Belgium on 9 October 1917 when a British attack was held up by machine gun fire from a German trench. Aged 26 at the time, John – known locally as Jack – organised a bombing party which captured the gun and killed the crew. He then jumped from the trench, calling for his comrades to follow him, running to a nearby house that was occupied by the enemy. Before any help could arrive, John became engaged in hand-to-hand combat. The enemy quickly surrendered and 20-30 prisoners were taken. 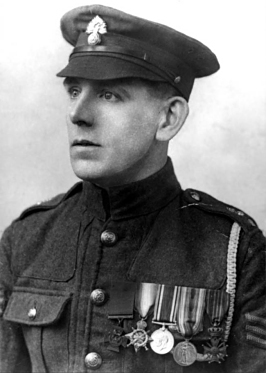 John was presented with the Victoria Cross – which he stated didn’t make him a proud man – on his return to Britain by King George V, and was given a hero’s welcome when he finally came home to St Helens. A fitting rendition of ‘The Bluebells of Scotland’ was performed by local accordionist Jennie Nolan in tribute to John, who performed the Scottish folk song on the day he was honoured for his Victoria Cross at St Helens Town Hall on 1 January 1918. Among multiple generations of family members, guests at the ceremony included Deputy Lieutenant Mr Alan Chick; Colonel Mike Glover (Lancs. Area Secretary The Royal Regiment of Fusiliers) (the regiment in which John served); Council Leader Barrie Grunewald; MP for St Helens South & Whiston, Marie Rimmer – and Seve Gomez-Aspron, the council’s Armed Forces Champion. Speaking afterwards, Councillor Pearson said: “It’s a great privilege to be asked here today to unveil a commemorative stone in honour of Sergeant John Molyneux. 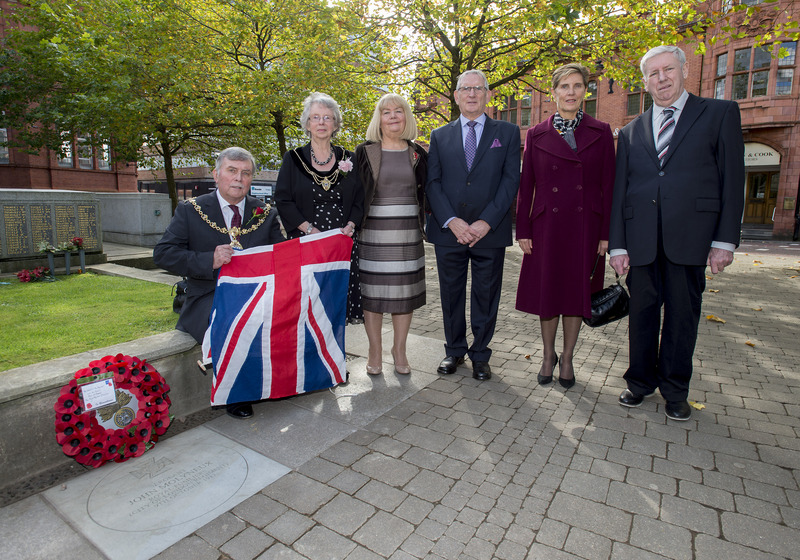 The commemorative stone is part of a programme of work by St Helens Council and partners to honour the borough’s four VC recipients on the centenaries of their presentations. 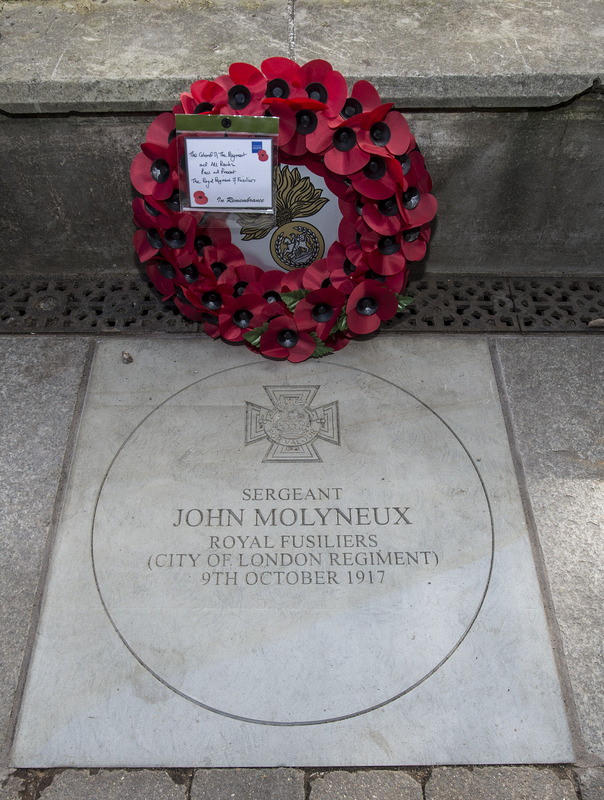 In July this year, Sergeant Molyneux was also honoured by St Helens Council when a new street in Sutton was named John Molyneux V.C Close – while an honorary paving stone was laid in Victoria Square in 2015 in recognition of Company Sergeant Major Frederick William Hall, once of Ormskirk Street, who was killed in action in Belgium during the Second Battle of Ypres. 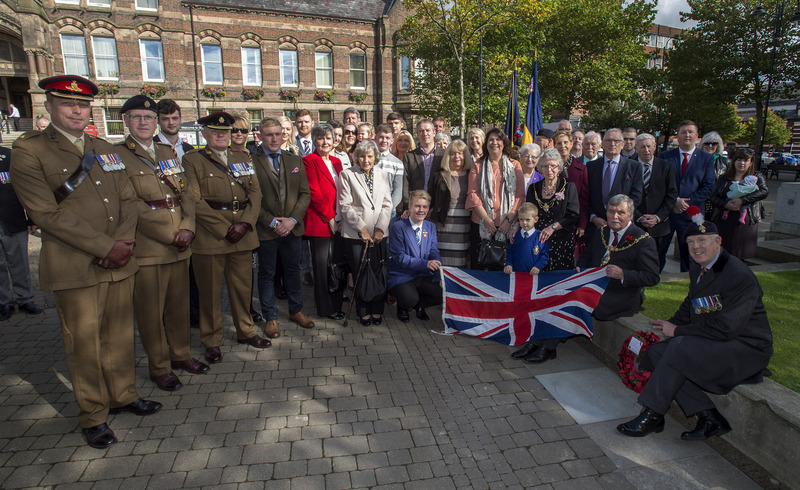 Meanwhile, the Newton and Earlestown Community Group are also raising funds to erect a statue in 2018 to commemorate Newton-born Private Norman Harvey, who received his Victoria Cross for actions in battle at Ingoyhem, Belgium in October 1918. Norman’s battalion was stopped by machine gun fire and suffering casualties when he ran forward and engaged the enemy single-handed, killing two, wounding one and capturing 12 men and two guns. A Newton street has already been named in his honour. The final VC recipient is Corporal John Thomas Davies, who, on 24 March 1918, leapt to defend his comrades as they retreated, firing his Lewis gun into the enemy and stalling their advance. Captured and later released, John spent the majority of his life in St Helens, and was buried in St Helens Cemetery upon his death in 1955. Plans to commemorate John will be revealed next year on the centenary of his VC presentation. Sergeant John Molyneux passed away on 25 March 1972 at Ashtons Green Home in Parr, aged 81. He was cremated at St Helens Cemetery and his ashes were scattered in the Garden of Remembrance.